Hart Miller Design is a multidisciplinary studio that maintains craft and context at its heart. With its sister company, MARK Product, it is able to master the creation of amazing spaces, rooted in place and fill them with the appropriate furniture it has crafted itself. Co-founder Anna Hart, tells us that ‘practising as a design studio, we have an awareness of what it’s like to be looking for products and how important price can sometimes be or how important an aesthetic can be’, and nowhere is this more evident than in its sixth collaboration with Origin Coffee Roasters in Penryn, Cornwall. Perhaps what made this project so challenging to execute in practice is also what makes it so endearing in character. The harsh edges of the rough-faced granite is balanced by a clean-lined design. The subtle timber joinery details of the wall panelling create intrigue in forming shadow gaps on an otherwise plain wall. This cabinetry is painted in a cool, pale green, providing a canvas for greenery of the plants to sit against. Hart Miller Design has employed a finely tuned palette – of both materials and colours to create an approachable and inviting space. 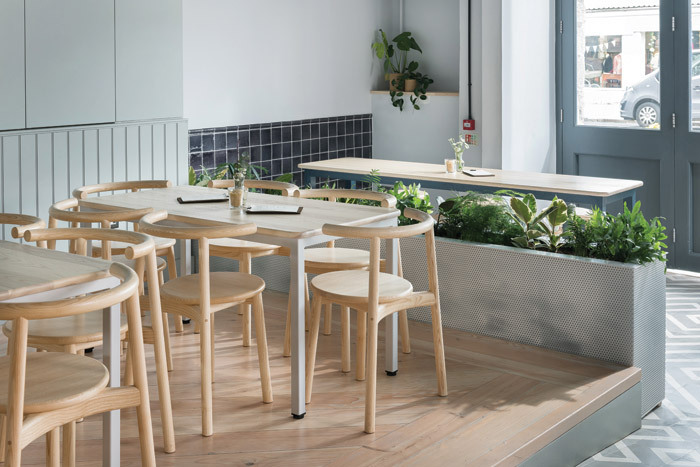 In using bespoke tables produced by MARK Product, the design appears seamless, as they blend with the pine flooring, materials for which were hand selected by the same designers. Statement tiles largely dictate the colour palette – creating two focal points to the design. 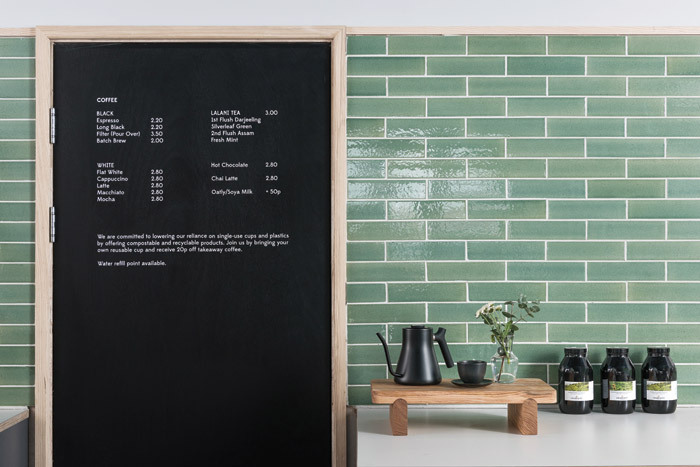 Taken from Designworks Tiles’ Winchester collection, Hart Miller Design created a feature wall behind the counter in rectangular green tiles, to give the design a focal point and base colour from which other colours in the palette are taken. 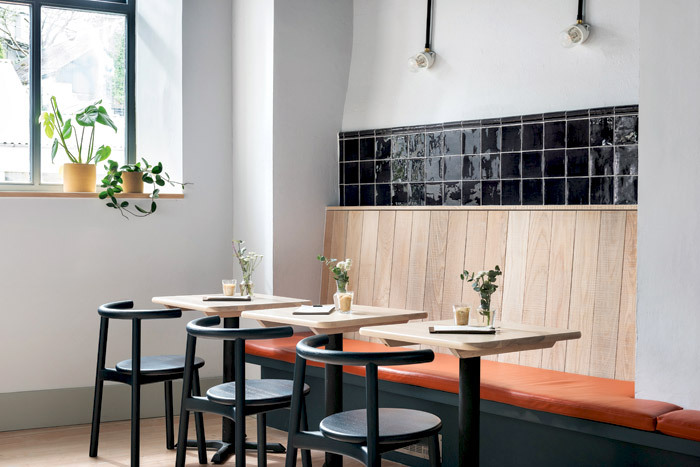 From the same Winchester collection, Hart Miller Design has used square black tiles to highlight seating areas, forming the second focal point. A third focal point is created in accent orange seat cushions, creating a burst of colour in the otherwise muted-colour space. In designing the space, Hart Miller Design also specified all of the accessories, as well as commissioning Toro Studio to supply a planting scheme, one that is central to the scheme. Additionally, Origin Coffee Roasters’ founder, Tom, commissioned local ceramist Dor & Tan to produce plates, bowls and planters, which Hart says ‘create wonderful touch points with their textured finish; all elements we feel are important in rounding off the customer experience’. Primarily focusing on the interiors, Hart Miller Design were still able to make minor interventions on the exterior. Painting over the royal blue of the window and door frames in favour of a more subdued blue-grey, the practice ensured that the street presence was merely dominated by subtle signage and a glowing ‘coffee’ light box. In doing so, it ensured the premises maintained the look and feel of its namesake, a warehouse. Hart Miller Design was able to bring a unique approach to the scheme, both through knowing its client’s wants and needs inside out and in having a detailed, personal knowledge of the site. It is clear that in this collaboration, they couldn’t help but make something beautiful, responsible and useful. What results is a seamless design – both in its context and its operation.